A user-research and product design project, with Praew Suntiasvaraporn and Vicky Hwang. We identified that the problem of unconsumed food waste is very common, especially among our peers. Most households, families or college students, live at least two people, and thus fridges are usually shared. From conversations and our own experiences, it is a very typical to find unconsumed food in shared fridges that has gone bad due to negligence, and was to be thrown out. Our initial assumption for the problem was that the lack of organization in shared fridges leads to easy negligence of food. We assume that our solution will be along the lines of a fridge organization or reminder system. We began our research through various methods. Aside from more traditional methods like online survey and in-depth personal interviews with both faculty members and college students, we also relied on behavioral observation and specially-designed activities to inform our research. We shadowed different groups of students after they went grocery shopping and filmed the whole process of how they unloaded groceries and reshuffled their fridges. 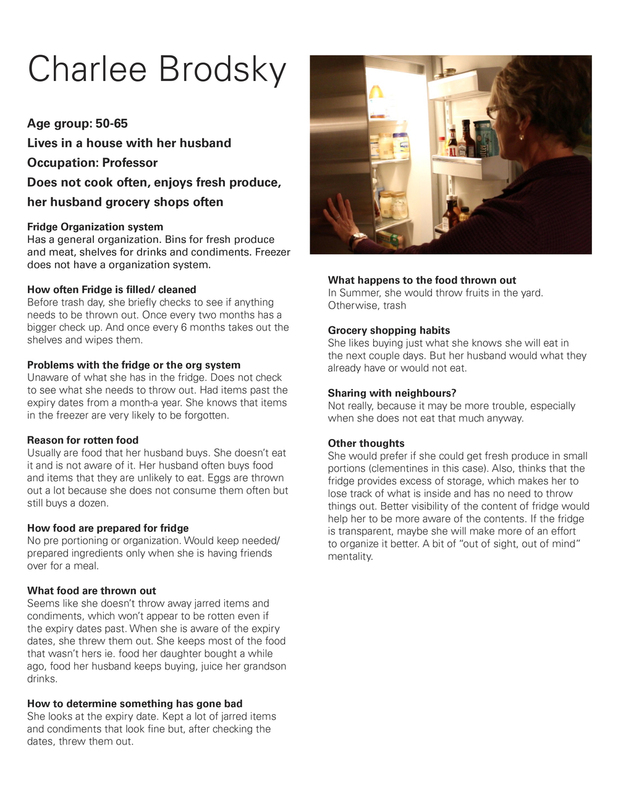 We also printed out different fridge templates and pictures of both new and old groceries (time of purchase specified), and asked our interviewees to sort them according to how they organized food at home. We wanted to see how they made arrangements and judgement on what to keep or to throw out. We were pleasantly surprised that most people actually already had some sort of a fridge organization method. What was true across different interviewees was that there was a general lack of communication regarding groceries – family members and housemates double buying the same products unknowingly, feeling reluctant to throw out or finish each other’s food without consent, and making assumptions about sharing bulk-bought food that would usually be miscommunicated. There was a general agreement that miscommunication among housemates or family members regarding buying, keeping and sharing groceries lead to overstocking and negligence of food in the fridge. Instead of a fridge organization system, the research findings led us to develop a product that facilitate communication among housemates or family members regarding groceries. We narrowed down the target audience to college students who share fridges since the context was more relatable. We proposed an idea for a mobile app, Foodr, which matches up to the fast pace of Millennials by allowing multiple functions with simple and convenient communication. The mode of operation, which is snapping photo and sending to friends with an easy swipe response, is familiar to the target users. The app addresses the primary issue of unconsumed food waste in terms of buying, keeping and sharing groceries, as well as fosters a communal element through the sharing function.